The Taiwanese company is committed to simplifying the complexities of data involved in internet advertising and turning it into something its clients can use and understand. “KooData’s value is to make complex things simple. (We) handle a vast jumble of information and sort it out effectively,” Jason Sun, KooData’s CEO, said. The diverse tools KooData uses, such as Google AdWords, Yahoo! Keyword Advertising, Facebook and Google Analytics help to deliver high quality advertising and diagnostic systems. Communicating via social media is vastly popular in Taiwan. A 2015 report on smartphone usage found that eight out of ten people in Taiwan use smartphones daily. According to Sun, Google records billions of searches yearly, with half of them made on mobile devices. Besides Google, tech giant, Facebook, Instagram, Youtube and messaging app LINE are popular social media platforms in Taiwan. “Advertisements are one of the tools that enable communication between sellers and buyers,” Sun said. Sun noted that most of his customers are small and medium-sized enterprises (SMEs) and don’t have enough time or money to spend posting advertisements on each social media platform. “As a result, we provide integrated solutions and a competitive analysis report based on the client's industry needs. “Since most SMEs have limited budgets and human resources, we do everything we can do for our customers,” Sun said. “Customers don’t have to worry about new media technologies, such as how to use Google Analytics. It is our job to track them and give you recommendations." The main services from KooData include: platform advertising, digital integrated marketing, data analysis and graphic resources, which refers to making a banner or a EDM marketing campaign. So KooData launched “Vivido”, which allows companies to engage in video marketing with limited expenses that can be as low, he said, as two cups of Starbucks coffee. 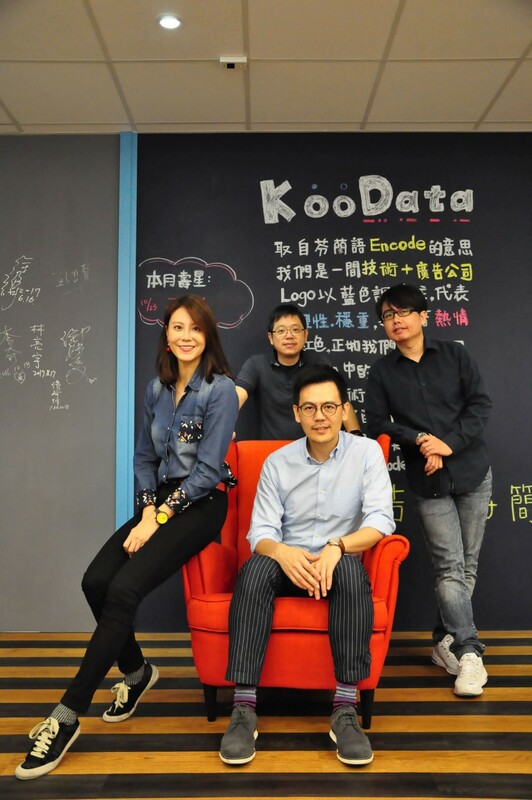 Caption: Vivian Meng , Coo of KooData, (from the left) , Jason Sun, CEO of KooData (the front one) and other members from the team. Over the last decade, Sun gained abundant experience in digital marketing. He was responsible for managing a keyword search service at a subsidiary of Yahoo! in 2004. “I have witnessed, as surely many other people have, the rapid change and growth of the power of social media. “I believe our services are suitable for Taiwanese SMEs and for global ones as well since they share the same problem: finding enough budget and facing a lack of human resources for these things. Therefore we also have some clients from overseas, such as Malaysia, Australia, and the U.S,” Sun said. Vivian Meng, KooData’s chief operating officer, took the interview with Business Next Media alongside Sun. “KooData has noticed the rapid growth of social media users, especially in the Southeast Asian region. “Therefore, we’d like to actively introduce our services there. What’s more, we are going to Spain for the Mobile World Congress for the very first time to introduce our services to Europe,” Meng said. “I think the core value and culture of our company is: Dare to try and not be afraid of failure. “In the beginning of 2019, KooData surely will bring more interesting services to help more SMEs and we also hope to find more talent to join us,” Meng concluded.